"Good evening, and welcome to a private showing of three paintings, displayed here for the first time. Each is a collector's item in its own way, not because of any special artistic quality, but because each captures on a canvas, suspended in time and space, a frozen moment of a nightmare." I don't know about you guys, but I consider myself a massive horror fan. And thus in the world of Mr. Rod Serling, I've always found myself drawn more towards the writer/host's short-lived horror anthology series Night Gallery than to his much more well-known sci-fi anthology The Twilight Zone. Not that there's anything wrong with The Twilight Zone. Not by any means. It's just that Night Gallery consistently scared the pants off this guy back in middle school. And if you were more of a fan of Sterling's Night Gallery as well than you'll be pleased as punch to hear that this series is getting its own reboot in the near future. Yes, Deadline just reported that after a "competitive situation" good old SyFy has snagged up the rights to the revamped series and will be developing it along with executive producers Jave Davis and David Janollari. Davis is a name you might recognize as the man that created and executive produced MTV's successful revival of the classic Michael J. Fox is a werewolf flick Teen Wolf, and Janollari is perhaps best-known for serving as the executive producer on the cult-classic series Midnight, Texas. The Night Gallery reboot will be co-produced by Universal TV, where David Janollari Entertainment is based, and Universal Cable Prods. and will, "update the series for the digital age. 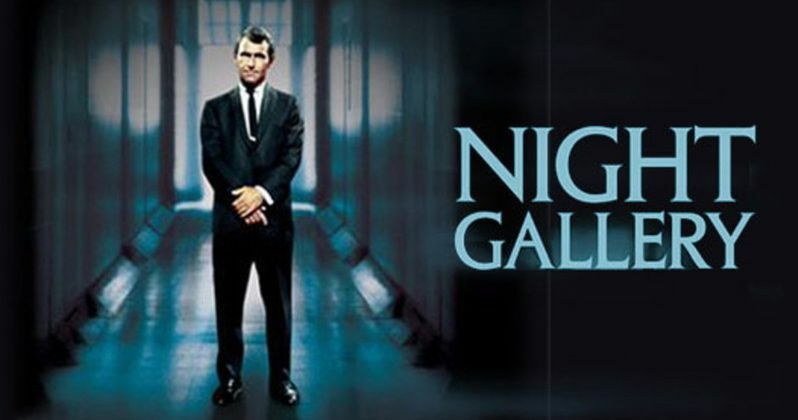 Featuring dark and twisted morality tales paired with Serling's specific brand of irony, Night Gallery will explore and exploit every modern nightmare imaginable, mining our fears of the dangers of social media." Night Gallery originally ran from 1969-73 on NBC. Like The Twilight Zone, Rod Serling was the host of this anthology series as well, appearing in an art gallery and introducing the macabre tales of each episode by unveiling paintings that depicted the stories. His classic intro can be seen as the opening paragraph of this article. Night Gallery presented adaptations of authors such as H. P. Lovecraft, as well as many original works by Serling himself. The series was kicked off with a TV movie that - get this - featured the directorial debut of a little guy named Steven Spielberg. You may have heard of him. This Night Gallery reboot is, of course, in addition to CBS All Access' upcoming revival of Sterling's The Twilight Zone. That revamp is executive produced by Get Out writer-director Jordan Peele, who will also host the new version of the classic anthology. As far as that series goes, we already know Adam Scott will appear in a remake of the infamously freaky Nightmare at 30,000 Feet episode (aka the episode with the gremlin on the wing of the airplane), and on top of Scott, the show has also added the likes of John Cho, Allison Tolman, and Jacob Tremblay to the cast among others. Deadline broke the original story.